Cairo composer and musician Maurice Louca is back with his most ambitious work yet. In Egypt's contemporary music scene, Maurice Louca has established himself as a maverick; an elusive, groundbreaking figure, both in his solo work and in his participation with acts such as Lekhfa, with Tamer Abu Ghazaleh and Maryam Saleh, and The Dwarfs of East Agouza with Sam Shalabi and Alan Bishop. He has also garnered an international reputation due to his unrestrained, audacious explorations through various frameworks of modern music. On his 2014 album Salute the Parrot, Louca used the template of electro chaabi to craft complex, hypnotic masterpieces, earning global acclaim, and helping place Cairo on the map of international contemporary scenes. He further cemented its status for fans of the experimental and avant-garde with Lekhfa's critically-acclaimed 2017 self-titled album. 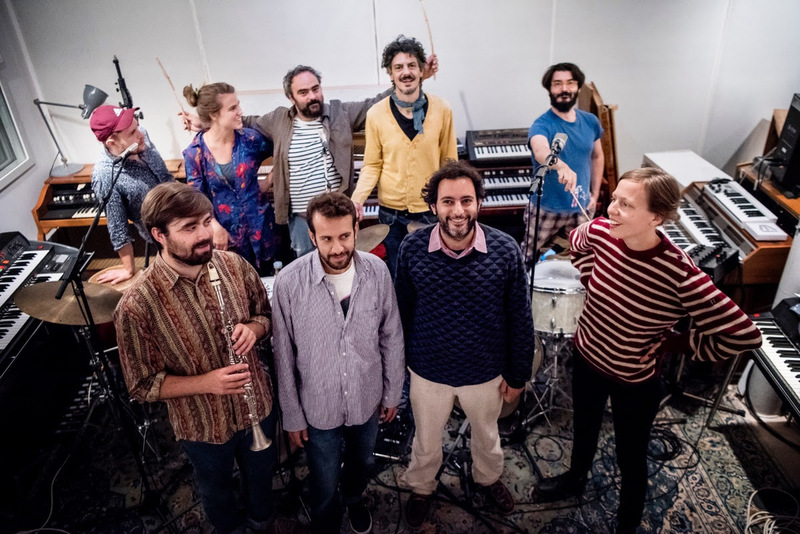 Five years after Salute the Parrot, his last solo release, Louca is back with Elephantine, six tracks of mesmerizing and challenging avant-jazz, played by a 12-piece ensemble of musicians from Italy, Iraq, Sweden, Turkey and Denmark, led by Louca. Though stylistically this album reflects a complete departure from Salute the Parrot, resembling more his work with The Dwarfs, Louca's knack for weaving webs of cathartic sound based on unconventional motif and structure remains consistent. It is, without doubt, his most visionary and challenging work yet. Elephantine begins with "The Leper", the single that preceded the release of the album. A repetitive guitar melody starts the track, an ominous cloud of low horn screeches and cymbals slowly swelling in, before swinging open into a loping, jazzy theme, shadowed by the vibraphone. The cheerfulness of the melody is counterbalanced by the discordant hum of the horns. Eventually, the tune opens up into a sort of deranged Afro free-jazz mayhem, with ecstatic Yemeni rhythms. The next track, "Laika", builds off of a looping, minimal melody, levels of horns swarming in and out of each other like a hive of free-jazz crazed bees. "One More for the Gutter" begins with a Tuareg-blues-esque guitar line, teasing a notion of tranquility, before this is shattered by a wall of sound that crashes down so unexpectedly, if you have the music turned up at all, your breath jumps out of your chest. From here it throttles forward in psychedelic cacophony, before shuddering to a halt. "The Palm of a Ghost" is an aesthetic reprieve from the horn-heavy album: it is stripped down to guitar, oud, violin, minimal percussion, and features Egyptian musician Nadah El Shazly- the only vocals on an otherwise instrumental album. Shazly's otherworldly voice floats effervescently over spooky chromatic melodies that plod forward repetitively and unrepentantly. It's difficult to tell if the title track "Elephantine" is improvised or orchestrated, however almost every time that a stretch of seemingly unstructured noise lulls you into believing the prior, the band comes together in impeccably timed, but minimal breaks, to remind you that Louca has in fact orchestrated the insanity. It paints a supernatural atmosphere, placid but eerie. The final track, "Al Khawaga" is perhaps the most abrasive on the album, with hefty baritone horns, unnervingly dissonant melodies, and thrashing saxophones. It eventually breaks into what sounds like an oddball, dissonant parlor jazz band playing a party at a catacomb. Elephantine marks a meaningful stride forward for Louca, from solo producer, to composer and arranger. He doesn't even touch a synthesizer on the album, opting instead to play guitar and piano. "There was a blessed thing about the process of making this record," Louca says in the press release for Elephantine. "The dynamic between us musically but also as people...What these musicians delivered was really more than I could ask for. Everyone played their hearts out on this record." Recorded in Stockholm, the album boasts an impressive quiver of instrumentation: drums, percussion, bass, vibraphone, oud, violin, guitar, piano, and a rainbow of brass and woodwinds. Devoted fans of Salute the Parrot will be shocked by Elephantine, and likely disappointed, as it maintains none of the accessibility of the earlier album, which is still thrown onto the dance floor at select parties in Cairo and beyond. There is practically no musical similarity, unless you look into the greater picture of who Maurice Louca is; fans of Maurice in all his incarnations will have an easier time placing Elephantine within credible context of the artist's work. Furthermore, they will understand that within the progression of an artist, there will inevitably be ruptures; destruction and recreation. Elephantine itself, ideally listened to whole, feels as if it is constantly destroying and rebuilding itself from the inside out, purging and consuming energies. More than anything, the grandiose proportions of Elephantine impress - what was undoubtedly a monumentally challenging album to make, marks Louca's most subtly crafted and mature work yet. Consistently defying and destroying the walls of genre, Maurice Louca is a musical dynamo; ephemeral, and perpetually unpredictable. Lahti, mixed by Adham Zidan and mastered by Heba Kadry. Follow Maurice Louca on Bandcamp and Facebook.